The legal pressure on the prominent family behind the company that makes OxyContin, the prescription painkiller that helped fuel the nation's opioid epidemic, is likely to get more intense. Members of the family that controls Connecticut-based Purdue Pharma are also defendants in a lawsuit brought by New York's Suffolk County. Few, if any, other governments have sued the family so far. But Paul Hanly, a lawyer representing the county, said he expects to add the Sacklers to other opioid suits. He explained last year that he was targeting the family, known for its donations to some of the world's great museums and universities, in part because they took "tens of billions" of dollars out of Purdue Pharma. Having Sackler family members named as defendants in Massachusetts "indicates that the government attorneys believe they have the 'smoking guns' necessary to broaden the potential liability of those at the top of the organization," he said in an email. The allegations could tarnish a name that is best known for its generosity to museums worldwide including New York's Metropolitan Museum of Art, which has a Sackler wing, and London's Tate Modern. 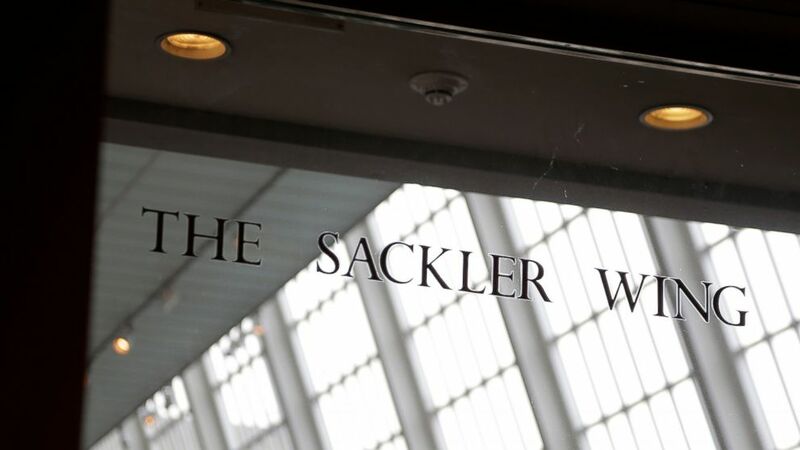 The Sackler name also is on a gallery at the Smithsonian, a wing of galleries at London's Royal Academy of Arts and a museum at Beijing's Peking University. The family's best known and most generous donor, Arthur M. Sackler, died nearly a decade before OxyContin was released. In its lawsuit filed last year, the Massachusetts attorney general's office went after members of the Sackler family and Purdue, which is structured as a partnership and is not publicly traded. The company's flagship drug, OxyContin, was the first of a generation of drugs that used a narcotic painkiller in a time-release form. That meant each pill had a larger amount of drug in it than other versions and could get abusers a more intense high if they defeated the time-release process. Many of the attorney general's specific allegations — based on company documents — were blacked out at the request of Purdue and the Sackler family. The state recently filed a new version of its complaint that made public many of their allegations for the first time. The state is asserting that Richard Sackler, a son of a company founder and at the time a senior vice president for Purdue, as well as other family members pushed selling OxyContin even when they knew it could cause problems. When the drug was first sold in 1996, the filing said, Sackler told the sales force "the launch of OxyContin Tablets will be followed by a blizzard of prescriptions that will bury the competition." In 2007, the company and three current and former executives pleaded guilty to criminal charges that they deceived regulators, doctors and patients about the drug's addiction risks. The company agreed to fines of $634 million. The next year, according to the Massachusetts lawsuit, the company pressed ahead with a new version of the drug designed to be harder for abusers to crush. It did so without first conducting trials and despite a warning from the company's CEO that the new version "will not stop patients from the simple act of taking too many pills." Purdue responded to the Massachusetts filing with a strong statement: "In a rush to vilify a single manufacturer whose medicines represent less than 2 percent of opioid pain prescriptions rather than doing the hard work of trying to solve a complex public health crisis, the complaint distorts critical facts and cynically conflates prescription opioid medications with illegal heroin and fentanyl." "The drug companies have an interest in settling their own claims globally," she said.